I love me some smoothies! You can easily adapt smoothie recipes to whatever you’ve got on hand and they tend to be very forgiving for the sloppy cook like me, who likes to eyeball ingredients rather than measure them. Strawberries are one of my favorites because the carb count is low but it still tastes great. In this version, I use mostly strawberries but a few peaches to round off the flavor. If you’re using this for breakfast, you could also add a scoop of Protein powder to make it more of a filling meal replacement. I always use Greek yogurt when I’m using yogurt in my smoothies, as it has lower carb counts. It doesn’t take a lot. Compare the brands you have available and you should be able to find something reasonable. If you have a heavy duty immersion blender, you don’t have to worry so much over crushing the ice and can use your fruit right out of the freezer! As listed, this comes in at about 13 net carbs which I realize is too high for some of y’all. To reduce that number, use less fruit. It just won’t taste quite as indulgent. Simple fruit smoothie recipe you can use as a springboard for you own creations. 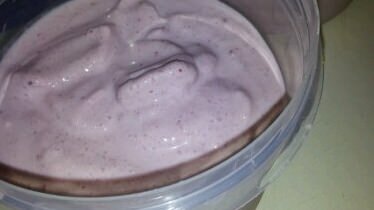 In a tall container, assemble frozen fruit, ice, yogurt, heavy cream, and sweetener. Using an immersion blender, blend it up! Add extra almond milk or ice as needed to finish it off! Eat it immediately, or put in a lidded container to freeze for Strawberry ice cream! I use liquid Splenda (i.e. EZS-weetz) for sweetening no extra carbs. If you use another sweetner, you'll need to add the carbs to your total.